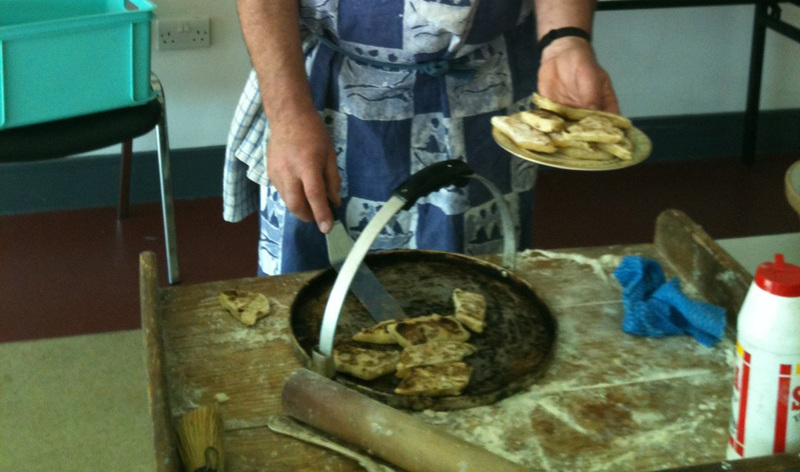 Otherwise known as “Fadge”, “Thins”, “Tatey bread” or the variant “Purd-oaten”, these are all made using potatoes and flour – very simple. In days of yore, spuds would probably have been cheaper than flour. As the winter progressed, the aging spuds would be suffering from prolonged storage, with bad bits enlarging and generally becoming less presentable. Bad bits could be cut away and the good bits salvaged from the damaged spuds. These old spuds would really lend themselves to be used for mashed potato rather than cooked as whole spuds. It certainly is simplicity itself. Take a clatter of spuds, peeling the skin and discarding any black bits or rotten bits. Cut into slices or pieces, aiming for around 2 – 3 cms thick. Cover with water and boil. Test after about 15 minutes with a fork, and if the fork goes in easily, the spuds are cooked. You want a reasonably even consistency, so make sure most of the spud pieces are cooked well enough, but it won’t work if they are overboiled and falling to pieces. Drain the spuds well and then mash to an even consistency. At this stage, you can mix in salt and butter to taste. Mashed spuds are nice with a fair bit of butter, I would estimate about a tablespoon per 3 spuds or thereabouts. Leave for about 1/2 an hour to cool down – leave the lid off the saucepan. When cool enough to handle, scoop out about 2 cupfulls of mashed potato, and add between 1/2 and 3/4 cup of flour. The exact ratio depends on how you like the end product – the greater the amount of flour, the drier the final bread will be. Any flour will do, and if you can’t take wheat, use some other type, or else fine oatmeal for the purd-oaten. Mix well and turn out onto a floured board. Work it together and begin to flatten it out with a rolling pin or bottle, so that it is about 1/2 cm thick. Again, it depends on how you like it, but too thin and it will be floppy and not so good. Heat up a griddle if you have one, otherwise a heavy frying pan, and spread some butter – the surface should be hot enough for the butter to melt and sizzle but not burn. You could try cooking them on a dry griddle/pan as well, because the butter can get smokey and probably set off your fire alarm! Cut the flattened mixture into desired shapes (we kinda like triangles) and cook on the pan, turning when browned. They probably need about 4 or 5 minutes a side. The taste of your first batch should enable you to determine the right seasoning for your own preference. Enjoy.